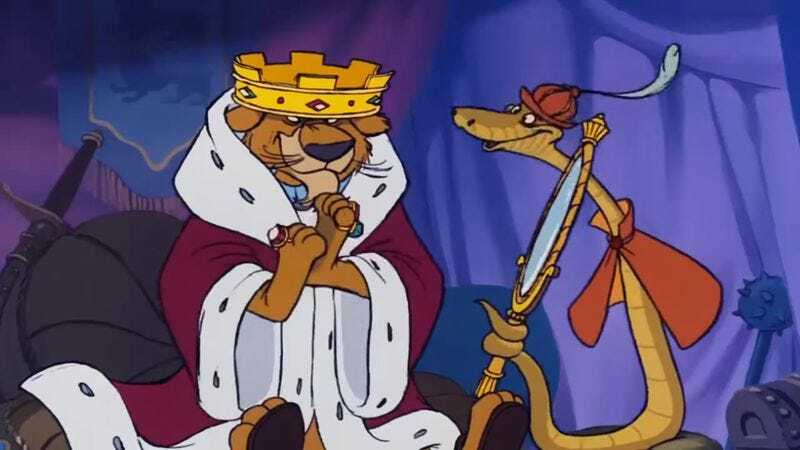 The animated version of Robin Hood is curiously not the first time Disney tackled the story of he would rob from the rich to give to the poor. Unlike The Story of Robin Hood and His Merrie Men, Robin Hood grants the makers more freedom to be both more kid-friendly and less grand. One can see flaws in it, but it has enough charm in it that one ends up liking Robin Hood. Narrated by rooster Alan-A-Dale (Roger Miller), we learn of the fox Robin Hood (Brian Bedford) and his BFF, bear Little John (Phil Harris). They're happy-go-lucky fellows living in Sherwood Forest when they come upon the greatest prize: the royal coach of lion Prince John (Peter Ustinov) and his right-hand man snake Sir Hiss (Terry-Thomas). Disguised as fortune tellers, they hoodwink our imbecile tyrant out of his loot. Prince John, who has a Mommy Complex, is enraged. He keeps putting the squeeze on the citizens for money, something the wolf Sheriff of Nottingham (Pat Buttram) does to great delight. Meanwhile, young rabbit Skippy (Billy Whittaker), whose idol is Robin, comes upon the vixen Maid Marian (Monica Evans) and her lady-in-waiting, chicken Lady Kluck (Carole Shelley). Marian invites Skippy and his friends to come and play with them, where they all mock Prince John. Marian pines for Robin but figures he's forgotten her. Far from it, for Robin still dreams of Marian, even willing to fall into a trap of an archery tournament for her. He almost is, but a combination of Marian's pleas and Little John's blade saves Robin. When Prince John learns there's a song among the people of Nottingham mocking him, he is so enraged he orders taxation tripled. Anyone who can't pay gets locked up, leading to everyone getting locked up. Things come to a head when badger Friar Tuck (Andy Devine) is arrested and sentenced to hang when he attacks the Sheriff for taking money from the poor box. It's up to Robin and John to rescue both the Friar and the citizens, before a regis ex machina saves them all and things end happily. If you examine Robin Hood, you can see the flaws. This is not a lavish production by any means. Among the films more noticeable aspects is how they were unafraid to recycle sequences and even characters. More than once when the various animals are involved in a chase you can tell easily that they are using the same animation cels to essentially repeat the motions. Even more surprising is in how the characterizations of some of the animals was repetitive to what had come before. 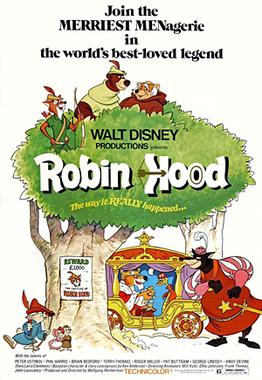 Robin Hood was released six years after The Jungle Book, with only The Aristocats in between them. For all intents and purposes, Little John was Baloo and Sir Hiss was Kaa in all but name. At least with Sir Hiss, they opted for a different voice, but Little John and Baloo were played by the same man in the same way. In terms of using songs in story, Robin Hood to its credit is not afraid to go dark. The Not in Nottingham number sung by country crooner Miller is quite sad and mournful, which is pretty much at odds with almost the rest of the story. If one looks at both the feel and the music for Robin Hood, it's actually quite upbeat, even if the 'wah-wah' guitar make it a dead giveaway that this is the early seventies. From the upbeat opening Whistle Stop (which introduces the characters and voice-actors, a curiosity among Disney films) and Oo-De-Lally (which is where we see "Robin Hood & Little John walking through the forest"), down to the jazzy Phony King of England, Robin Hood is pretty light confection. There is one exception, the love ballad appropriately titled Love. This is the musical highlight of Robin Hood, sung beautifully by Nancy Adams, which has some beautiful animation where we see Robin and Marian reconnecting. The music and lighting bugs floating among our lovers is sure to enchant. Robin Hood also cuts back on characters, with no real Merry Men. Instead, we get a buddy picture with Robin and Little, who are more like naughty boys than brave outlaws. Perhaps Robin Hood's biggest flaw is its resolution. Richard the Lionheart just appears and resolves everything (the regis ex machina). However, I have to remember that Robin Hood is one of Disney's more kid-friendly films where things are meant to be a bit more broad and bloodless. I'm not sure any creature was hurt. Moreover, the performances indicate how things were directed. Ustinov's Prince John was a totally inept villain, made more so by him instantly crying "Mommy!" and sucking his thumb at the mere mention of his mother. Ustinov used his voice and droll manner to great use, constantly quipping on "corpulent clerics" and his frenemy Sir Hiss, whom he refers to as an "aggravating asp" and "procrastinating python". Ustinov has a way with words. Terry-Thomas' Sir Hiss was a delight as the sycophantic underling, and Buttram made his Sheriff villainous without being frightening. Shelley and Harris made a nice double-act with the clucky Lady Kluck and the daddy-o Little John. Miller was wonderful as the Narrator/Balladeer, who kept us informed of things. For the more serious aspect, Bedford's Robin had a pleasant charm of a rascal and Evans' Maid Marian a gentle manner. We got light moments, such as when we see Marian's wardrobe has a Robin Hood wanted poster in the style of a girl's locker, but these were kept visual more than vocal. Those moments are saved for others, such as when Lady Kluck takes on the Prince's guards in a manner of a football running back, down to having university fight songs playing as she tackles them. Robin Hood may be flawed, but its a nice delightful little romp that one forgives much of it.